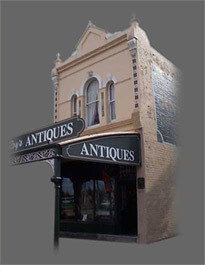 Roy Williams has been antiques dealing in Melbourne since 1979. His nine years of tertiary education are all relevant to antiques. He has published two books and hundreds of magazine articles. He had a shop in San Francisco in the 1990s and has exhibited at Antiques Fairs in Australia and the USA. The 1990s were a busy time, with Roy being an ‘expert’ on three weekly ABC talk-back radio shows for 7 years. Regular television appearances included Good Morning Australia, Healthy Wealthy and Wise, etc. etc. Now in semi-retirement Roy lives entirely for pleasure, only writing a dozen articles a year, and opening his shop four days a week. Septembers are usually spent studying abroad, favourite places being Paris and New Orleans.